Many organizations have chosen to invest their resources in causes outside of their offices to make an impact. One of these is S&P Global, who supports women entrepreneurs through sharing their knowledge, leveraging their own tools and supporting woman-owned small businesses. As part of their dedication to recognizing women entrepreneurs, S&P Global ordered more than 3,200 cupcakes from a woman-owned small business, Brooklyn Cupcake, for their one-year rebranding anniversary. S&P Global shot a video that explains their mission to empower women entrepreneurs and tells Carmen Rodriguez’s, Brooklyn Cupcake Owner, story. Rodriguez’ empowering story of starting her own business and S&P Global’s message about the importance of women entrepreneurs compliment each other to build a dynamic corporate image video. Social media is one of the most effective tools organizations can use to spread their message to a large audience. When using these platforms correctly, organizations can establish themselves as thought leaders. 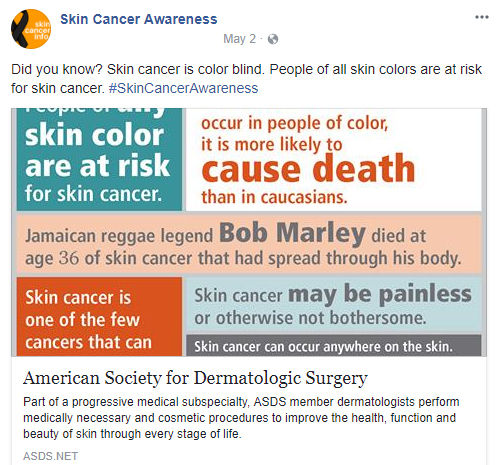 American Society for Dermatologic Surgery coordinated a month-long campaign using various social media channels in honor of Skin Cancer Awareness Month. 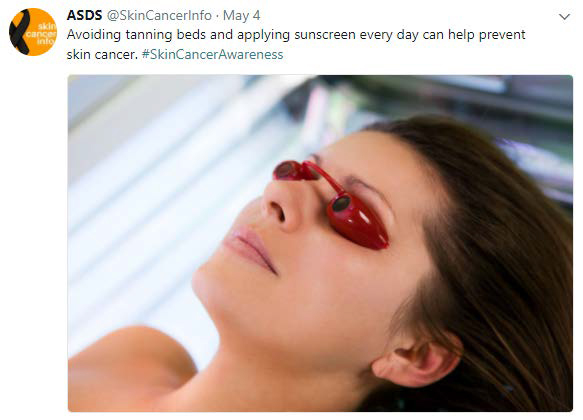 The organization aimed to increase awareness surrounding the topic, and establish ASDS as a reliable source of information surrounding skin cancer awareness. The campaign utilized print media, email, website and social media messaging to reach its targeted audience. 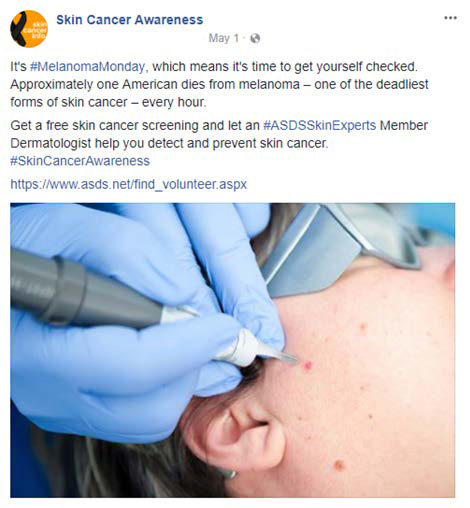 ASDS coordinated several Facebook and Twitter messages throughout the month of May that included skin cancer facts and figures, promoted their services, and linked to informational posts and videos. The campaign was an overwhelming success, increasing ASDS’s reach by 3,000 and garnering more than 8,000 impressions. The organization successfully drummed up awareness surrounding their cause through social media while establishing their platforms as a reliable source of information. The deadline for the 2018 AVA Digital Awards is December 14. Enter now. Do you need a flask for your premium whiskey? You may think you don’t until you watch a video of the product from QA Graphics. The small company in Ankeny, Iowa creates big-time graphics for a variety of clients. QA Graphics worked with Discommon Goods to create a product video that captured the sophistication of the Macallan x UWERK flask dual tank flask. The Macallan dual tank vessel is the Swiss watch of flasks. To convey that message, QA‘s graphic designers and 3D modelers take the well-machined and highly designed flask and bring it to life. Mirrored Media of Los Angeles blended these elements together to create an integrated marketing campaign to promote the BMW brand. 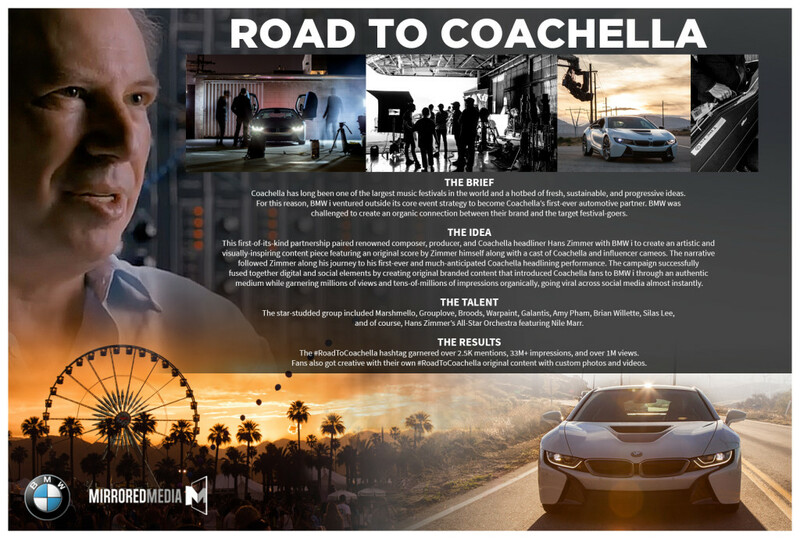 Called “The Road to Coachella,” the campaign followed composer Hans Zimmer and celebrity friends as they traveled in BMW vehicles from L.A. to Indio, California where Zimmer headlined Coachella Music Festival. The campaign featured original music that was composed for the road trip and gave fans an inside look at BMW’s cars and the festival. The campaign was an overwhelming success, with the #RoadtoCoachella hashtag and video reaching more than 2,500 mentions, 33 million impressions, and 1 million views. Winnie the Pooh is a perennial character in literature, movies, television specials, and toys. Although Pooh is a nostalgic character for older generations, newer generations are not as familiar with the character. Disney Consumer Products was faced with the challenge to reintroduce Pooh to newer generations with their own household characters. To introduce today’s children to Winnie the Pooh, Disney created a digital campaign that reaches parents. In a clever digital tagged ‘First Best Friend”, Disney targets new parents and reminds them of something they may have forgotten. Pooh is rendered as a living, breathing, cuddly creature ready to make new memories with new friends. The series of videos is as charming as the character. Blue Marble Media, an Atlanta-based creative studio, was approached by the Georgia Department of Economic Development to create a video encompassing the overall Georgia experience. The studio produced a video that captures Georgia’s charm and tells the state’s story through stunning imagery. The video features music from a Georgia-based band, and shots of Georgia’s scenery, including vineyards, small towns, cities, forests, historical landmarks and much more. Blue Marble Media successfully captured the beauty of an entire state in one video in their project. The first deadline for the 2018 AVA Digital Awards is December 14. Enter now. Open Education Resources (OER) is a new academic trend that offers fully licensed documents and media to further enhance education. Recently, the University of British Columbia Library began offering OER and needed to alert it students and the general public. UBC developed a marketing-communications plan utilizing print, video, digital, and social media that targeted stakeholders both on and off campus. The campaign garnered impressive results, increasing web page traffic by 140 percent, Twitter engagement by 118 percent, and Facebook engagement by an astounding 1,116 percent. To view UBC Library’s full campaign, visit here. Creative professionals are often granted the opportunity to use their skills to work with organizations focused on the greater good. These experiences are not only gratifying because we bring the organization’s vision to life, but also because of the positive impact of these projects. Studio Flox GmbH collaborated with Humany Tee and Jugend Rettet to create a video that brings attention to the refugee crisis in the Meditteranean Sea. The agency created a video using advanced animation, a charming voiceover, and a storyline that features obstacles representative of challenges refugees see when seeking asylum. Studio Flox, Humany Tee and Jugend Rettet created the video not only to explain the refugee crisis, but also to bring attention to rescue operations, safe routes of entry, and how citizens can help the cause.